The item American Vampire, Volume 8, issue 6-11, scott Snyder, writer ; Rafael Albuquerque, artist, (electronic resource) represents a specific, individual, material embodiment of a distinct intellectual or artistic creation found in Austin Public Library. 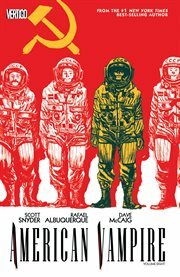 Scott Snyder and Rafael Albuquerque's award-winning series continues! Welcome to the '60s. It's a turbulent time to be an American-especially an American Vampire. While the rest of the nation uneasily watches the spread of communism across the world stage, the three surviving Abominus Americana-Pearl Jones, Skinner Sweet and Calvin Poole-are fighting a battle much closer to home. An evil right underneath their feet. The Gray Trader, the nearest thing to the devil this world has ever seen, is summoning an ancient beast from the depths of the earth. The original and oldest evil, this abomination would devour the world if freed. To prevent it, the American Vampires will have to fight the Gray Trader on two fronts, with one team targeting a top-secret government stronghold known as Area 51 and the other heading up-way up-into the final frontier! But can such an ambitious plan succeed when one of their own has already been compromised by the Beast?